Before I start this post, I'd like to let you know of a couple of Ikabana events that are coming up. 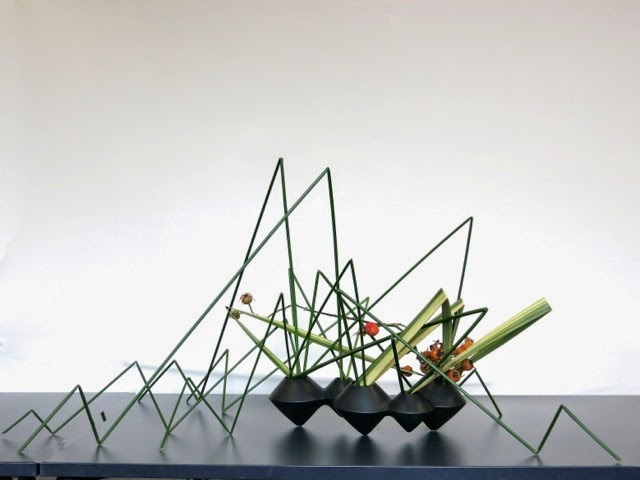 Although this is a western floral art group, my students and I have been invited to exhibit Sogetsu Ikebana in the foyer. Also, three of us senior ikebanists will be given a choice of paintings from which to pick one and do an arrangement to complement that painting. I'm really looking forward to that. And one more thing - in the Links part of my blog I've added two more - Sogetsu School of Ikebana Victorian Branch and Ikebana International Melbourne Chapter. So it's winter in Melbourne and I don't mind. I find I work a lot better in the cold than the heat but, of course, I prefer more temperate weather. Today started very cold but the sun has come out and it has turned into a glorious day. I've really enjoyed walking around outside collecting material for my ikebana. When we built our house 23 years ago, we had plans drawn up for a low maintenance garden. However, I started ikebana shortly after we moved in and started planting all the interesting material I saw the other ikebanists using. At one point I had the number of my local nursery on speed dial. I was also given many cuttings and plants by generous members of our group and every time I use each of these plants, they remind me of the person who gave it to me. So, now I have a prolific, high maintenance garden so that even in winter I can find many interesting materials such as branches, berries, leaves, as well as some flowers - calla lilies, green goddess lilies, hallebores, cymbidium orchids, some early jonquils, Siberian dogwood, Strelitzias and Japonicas. And, of course, let's not forget camellias. I get very excited when I see the first buds on my favourite, the Kamo Honnami. For those who don't know this camellia, it is single petaled, white and slightly tubular in shape. Not a vigorous grower but produces flowers over a long period. I can't resist including a photo. When I returned from Japan in mid June, my Japanese Flowering Apricot (prunus mume) had started blooming and has continued to date. It has the most delightful fragrance and delicate pale pink flowers. I used it in this large arrangement with my pink camellias. I also used it in this tall arrangement in my newly acquired container together with the ubiquitous calla lilies. The camellia in this next arrangement is much loved and used because it prolifically and grows well, so I can keep cutting without damaging or reducing the plant. Unfortunately, I lost the name tag so I don't know what it is called. Another winter flowering tree is the wattle, of which there are many varieties in my neighbourhood and I used one here. Wattles are bright and beautiful but they don't last once they are cut, so I don't use them very often. This little wall arrangement is made with a piece of dried date palm material and two anthuriums, which I grew in my bathroom. Last weekend our Sogetsu group had two days of very productive workshops with Yoshiro Umemura, who came down from Sydney. We always enjoy workshops with Yosh and we get a lot out of them. He is a consummate teacher and his calm and relaxed manner is conducive to learning and putting people at ease. Below are a couple of photos of Yosh's demonstration of an 'Arrangement to be Viewed from all Angles'. Lucy made this very interesting spider-like arrangement using umbrella grass, variegated flax and rose hips. We also had the theme 'Intertwining Plant Materials' and below is my example. I used a bigger piece of the same dried date palm, as above, dietes leaves, variegated flax and one calla lily. For the theme 'Showing Lines at Base', I found these cottoneaster berries branches that have beautiful curves. Unfortunately, they don't photograph well because the depth is lost. I used this large container that I made years ago and had to employ some serious mechanics to get the very heavy branches to stay upright. I finished off the arrangement with yellow asiatic lilies. I left my hasami in the picture to give some idea of size. The final theme was 'Repeating Similar Forms or Shapes'. We had an interesting discussion about what constitutes a form or a shape and how it all applies to this theme. 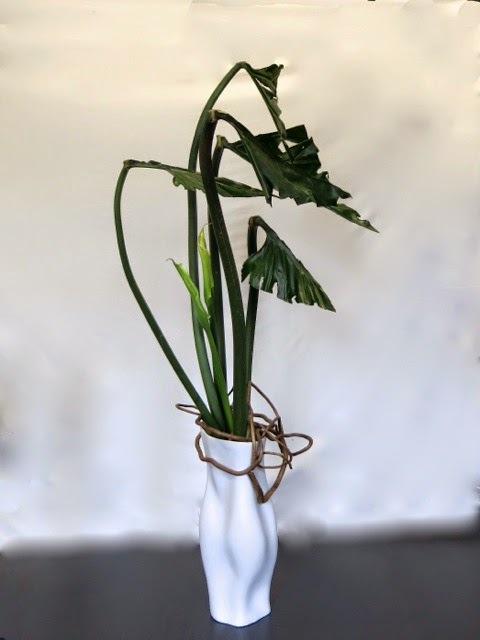 I used the stems and a very small part of philodendron leaves to create rough triangles, I added two calla lilies up high and some of the aerial roots from the philodendron at the mouth of this large container. You can see a lot more pictures from the workshops if you go to the Sogetsu Link. Christopher James puts a lot of time and effort in photographing and editing, so the photos are really rather good under the circumstances. I leave you with this last arrangement, which I did for my class with Elizabeth using a bare branch. I did it in a container that always reminds me of my father, whom I lost 14 years ago. He and mum had dropped in on the day I was working on it on my kitchen bench and he sat and watched me the whole time with a bemused look on his face. I so love reading your posts of your home and family and seeing your arrangements are so inspiring to me, Emily. Thanks so much for taking the time to share with us.